Our members looked forward to the 2006 AGM in St. Andrews, Scotland, with the greatest excitement. The AGM was held at Balmuto Castle on Saturday, 26th August, 2006 at 3:00pm, at the conclusion of the 27th International Congress of Heraldic and Genealogical Sciences, and we encouraged everyone to bring their heraldic paraphernalia for display during the Congress and at the AGM. 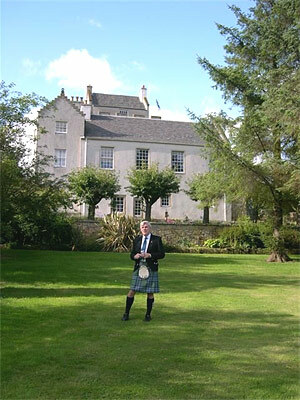 The event ended with members and guests enjoying a conducted tour of Balmuto Castle, where the image shown below was taken. Much of the original castle was destroyed circa 1560. The Castle incorporates a square keep (dated 1594) and two 16th century extensions, having vaulted basements. The corbelled-out parapet was added circa 1797. The Tower was restored between 1974 and 1984. 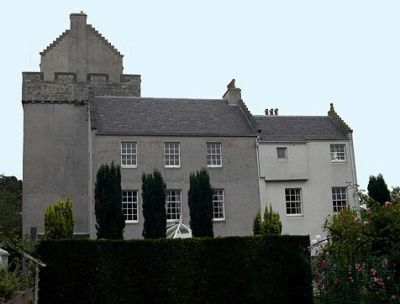 Formerly the property of the Glens, it and the Baronies (Balmuto and, a century later, Glasmont) passed to the Boswells by marriage in the 15th century. Sir Alexander Boswell of Balmuto was killed at the Battle of Flodden in 1513. The castle has been in the Boswell family for over 500 years, and is owned by the cousins of our Vice Chairman. "Mary Queen of Scots slept here" - yes, several times, in fact. The castle and the remaining 100 acres of the original 6,000 acres of demesne lands have been beautifully restored over the past 40 years, to the point that it is a Class B Scottish Landmark. Although the castle is not open to the public, the Vice-Chairman arranged a walking tour of the grounds and a tour of the castle.